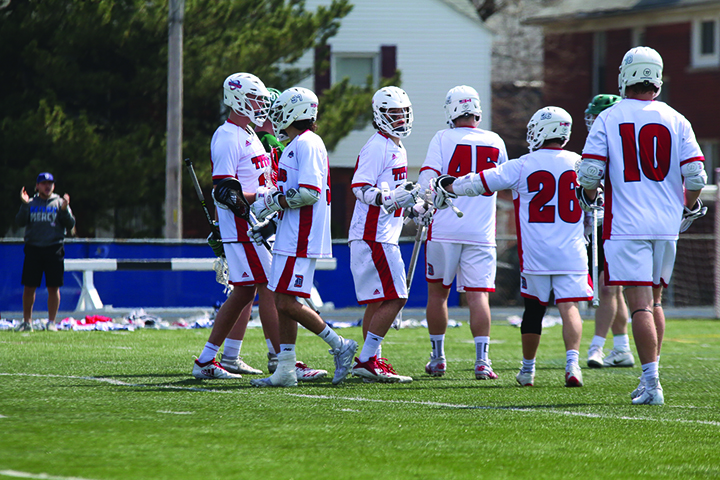 The Titans men’s lacrosse team has been playing well as the May tournament approaches. They are currently sitting at 7-3 overall and 4-1 in the MAAC conference, having won their last two games against Monmouth and Marist, placing them second in the conference. Titans have been playing especially well at home, where they’re undefeated and hope to remain that way for the rest of the season. What could be the reason for all this success? A major key is that the guys are close and play well together. It’s as if they know where each other is going even before they move. Some of the majors contributors have been Matthew Vangalen, who leads in assists; Seth Mendell, who leads in goals; defenseman Sam McLain, goalie Logan Shamblin and freshman Mitchell Durst. These guys, along with the rest of the team, have been bringing their A Game to each game. They’ve all been competing at the highest level every night to compete for something bigger later on, a championship. “Our strengths are great leadership from upperclassmen, our team chemistry is very strong and we have great communication on the field,” said Kelson Connors, a freshman. The Titans have four regular-season games remaining – against Canisius at home and Siena, Cleveland State and Utah on the road. The MAAC tournament begins May 2.